[Greek, Hebrew “adversary”] A lieutenant of the fallen archangel Lucifer and ranking member of his false hierarchy, mistakenly thought to be the archdeceiver himself. However, before his fall Satan had never attained to the rank of archangel. Thus in the hierarchy of fallen angels, neither he nor any other ever exceeded Lucifer. 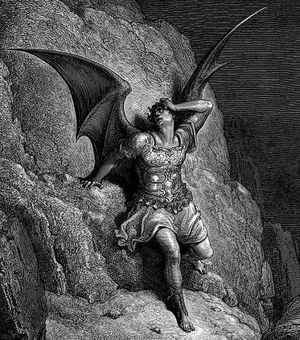 Both Lucifer and Satan and their various lieutenants have been referred to in scripture as the adversary, the accuser of the brethren, the tempter, the Antichrist, the personification of the carnal mind of mankind, i.e., the planetary dweller-on-the-threshold, Serpent, the beast, the dragon, etc. I announce to you that the Word has gone forth on Wednesday past, in the very triumph and the hour of the twenty-seventh, for the remanding to the Court of the Sacred Fire of the one you have known for so long as Satan. Blessed hearts, some of you who are our disciples worldwide have known that many years ago, in answer to the call of our messengers when both were embodied together, Satan was bound and his power reduced. Therefore, for the continuation of the flaunting of the law of the Person of the messenger, of the Person of the lightbearers, our Father sent forth the call to me to activate on that very evening the action of the call that would be for the judgment of that Fallen One. This event marks the second in the occurrence of the final judgment of the fallen ones by the work and the hand of our two witnesses, as the call has gone forth. You are aware of the judgment, the binding, and the second death of Lucifer. Therefore, now be aware of the binding and the judgment and the second death of Satan. Understand that the hour of the second death is following the trial at the court of the God Star. Thus, we have heard and we have borne our witness as to the influence not only of Satan but of the race of his seed called the Satans, who have infiltrated every corner of this galaxy and beyond. The seed of Satan has proliferated, blessed hearts, as you would not even conceive yourself in the most expansive imagination of your hearts. Therefore, even from that point—bound behind bars, lo, these many years—that Fallen One has had the focal point of a race of Satans who raised themselves up against the I AM Race so long, so very, very long ago. Therefore, these who yet strut on earth and other planetary homes remain in that state of an accelerated dissolution and a deceleration. They have lost the impetus of the original seed and the one who held for them that comparable manifestation which my Sacred Heart holds for you. This one, beloved hearts, has been the personal adversary of my lifestream and all who have come in the fullness of my joy. This occurrence, then, long anticipated and awaited by myself, will result in a new surge of power, wisdom, love, healing, transmutation, contact with my own through the blessed threefold flame of all hearts who are united with me! Blessed ones, though that seed is no more in its original manifestation, yet the stalking of the earth by those who are the copies of the original remains a point of alert to the faithful and a sign that, in the hour of their own dissolution, there is the ranting and the raving in those moments before the interior deterioration will manifest also in the final judgment that is become physical. Thus, all who were his seed and are his seed have also been judged at inner levels with him, for they are one and the same manifestation! But in the physical octave, there is yet the residual manifestation of these lifewaves. And thus, I have come to you that you might understand how there is a gathering of the forces of these antichrist and how there is the attempt, in the final hour just before their own disappearance from the screen of life, to move against the lightbearers and to take from them the imminence of the victory that does come in the hour of the sign of the marriage of the Lamb and the Lamb’s wife. Therefore understand that in the very hour of rejoicing, it is also the hour when the judgment call must go forth diligently to confirm on earth what has occurred in heaven. You realize, beloved hearts, that in the casting out of the Fallen One, out of heaven to the earth, there was then the manifestation on earth (and continuing to the present hour) of the warring of the seed of Lucifer and Satan against the seed of the Woman. When there is the withdrawal of the point of the cause, you also know that the effect must come to naught. Nevertheless, there is a necessary cleaning up of the debris. And this, too, is the mighty work of the ages! ↑ Rev. 20:2, 3. Satan was seized and bound by Archangel Michael in 1968. ↑ Jesus Christ, “The Final Judgment of Satan,” Pearls of Wisdom, vol. 25, no. 16, April 18, 1982. This page was last modified on 3 March 2017, at 00:56.